Celebrated architect advocates collaboration between architects and artisans. June 3, 2010 (RALEIGH, NC) — Architect Frank Harmon, FAIA, principal of the award-winning firm Frank Harmon Architect PA in Raleigh, will present a talk entitled “On Building with Craft” at HandMade: The Western North Carolina Craft, Architecture & Design Expo in Asheville on Friday, June 25, from 3-4 p.m. The Expo, a two-day event that brings the public together with artists, architects, builders and designers to share and learn about collaborations between craft artists, homeowners and industry professionals, will take place June 25 and 26 at the NC Arboretum, 100 Frederick Law Olmsted Way, Asheville, NC. Recognized nationally as a leader among architects who advocate regionally appropriate, sustainable modern design, Frank Harmon has incorporated work by local crafts people and artisans in many of his projects, including a series of 10 metal screens fabricated by Raleigh metalsmith Christian Karkow for an award-winning house Harmon designed in Mt. Pleasant, SC. Harmon said he was delighted when the organizers of the Asheville HandMade Expo asked him to give a talk. “A simple pleasure I enjoy each day is drinking tea from a hand-made bowl,” he said. “I know that a potter made the bowl, and touching its shape I indirectly touch his or her hands. It’s also possible to imagine the creek bottom where the clay was dug, and the geology that millions of years ago laid down the earthy sediment that I now hold in my fingers. In this way, however small, I feel a connection to the world. “I believe that one of the primary goals of architecture is to make it possible for people to understand the world around them,” he continued. “If we sense that a building is rooted in the earth and warmed by the sun, that fresh air flows through its windows and its materials are friendly to the touch, then we may feel that the building belongs to its place, and so do we. Tickets to the HandMade Expo are $15 per day or $25 for both days and are available online, along with information on the event, at http://designexpo.handmadeinamerica.org/tickets.html. For more information on Frank Harmon and to see other examples of his work, visit www.frankharmon.com. 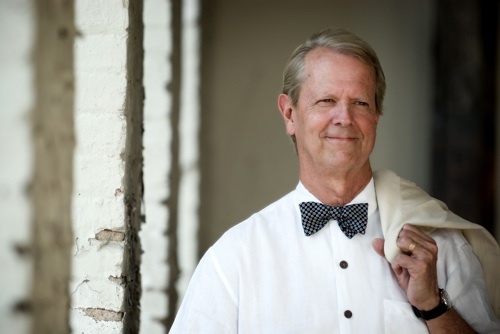 Frank Harmon, FAIA, is the architect of the Iron Studio & Maintenance Building at the Penland School of Crafts, and the new Craft Campus at the University of North Carolina-Asheville. His firm’s work has been featured in numerous publications and books on regionally appropriate, sustainable architecture and has been exhibited at the National Building Museum in Washington, DC. This year, Frank Harmon Architect PA was named 13th among the Top 50 Firms in the nation by Architect magazine. For more information visit www.frankharmon.com. The firm also maintains an active community on Facebook.